Mau Mau may be infamous for their fierceness and long dreadlocks, all part of the insurgency by Kenyan rebels against British colonial administration in the mid 1950’s. Their doggedness and tenacity ensured that the nation of Kenya would one day enjoy the freedom and sovereignty that it does today. Speaking of that tenacity and resolve, over half a century after that uprising, a group of Kenyan youth known as Ukoo Fulani Mau Mau brought an insurgency of their own – albeit a musical revolution. Tired with the lack of meaningful content, they come correct with their messages of religious, social and political injustices in today’s society. Yet in the midst of this radical hip-hop group, there stands a star, as bold and intrepid as the best of them, yet with a heart made tender by the sacrifice of Christ on the cross. Meet young gun Juliani. His ascent up the Gospel entertainment scene may have come rather quickly, but he’s been in the game for a minute, honing his mic skills and toning his spiritual muscle – all in readiness to serve Gospel fans a special lyrical feast. Juliani admits to being a ‘spiritual guy’ from his early years, having been raised in a strict Christian environment. Yet the message of Christ made no sense to him for many years, he was content to just drift through life, seeing where and how it would take him. He grew up as part of a large family, with one sister and five brothers. Born and bred in the sprawling Dandora suburbs, the spiritual home of many Kenyan hip-hop icons, including Kalamashaka and Ukoo Fulani, music effortlessly became a part of his existence. After attending Wangu Primary School, he moved on to the place where he would fall in love with the arts, Dandora Secondary School. There he started rapping after he met up with Wenyeji’s Robert who later introduced him to Ukoo Fulani. With his sleek lyrical flow and passionate delivery, he easily got absorbed into the group. Soon he started performing withjuliani them at many local gigs and clubs, especially at the renowned Florida 2000 night club and casino. In 2001 the group released the full-length album Kilio Cha Haki, and Juliani’s Fanya Tena was an attraction of it. As he continued to hang out with this group, their influence on his life slowly but surely began to reawaken his spirituality. Yet as he got more entwined with them, he begun to realize that their spirituality had a strange and mysterious feel to it, and differed from his own idea of religion. There, he carved a niche for himself as a guy who had an affinity for religion. Yet it wasn’t until the year 2005 that after much soul-searching and conviction he channeled his spirituality in the right direction and got born again. An artist he simply refers to as Brayo (of the group Warogi Wawili) had earlier on gotten saved, and introduced him to Nairobi Lighthouse Church. There, he began to get involved in fellowship, and steadily began to grow his walk. The niche he had at Ukoo Fulani Mau Mau now was no longer about just religion, but began to become about relationship; that with Christ. This was clearly reflected on the group’s second album, Dandora Burning, when his now hit single Jesus-nosis was released. The Gospel industry began to stand up and take note of this young rapper’s prodigious talent, and soon he begun to perform at a number of Gospel events, including the Zaidi Ya Mziki album launch by Jogg-C and Gospel Fathers, a stage where he could have easily stolen the show, The K-Rave, and many others. In August of 2006, his chance meeting with another amazing talent initiated what might very well be a storied career in mainstream acceptance. During a school mission at Moi Forces Academy, he bumped into Astar, who was impressed enough with Juliani’s flow that he decided to introduce him to Kijiji Records. Astar had just completed recording his debut single Close Your Eyes; a track that was riding high on the local music charts. 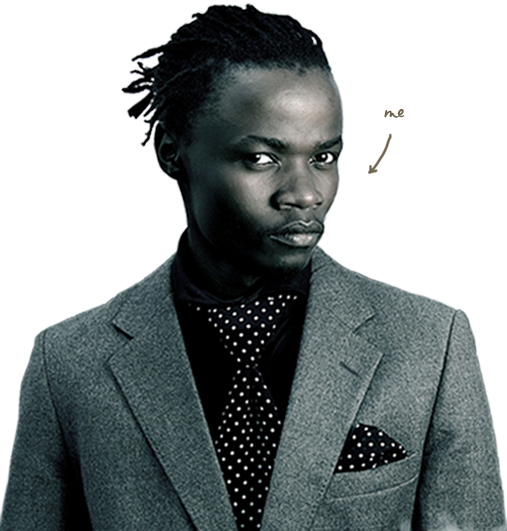 He made the unlikely gesture of inviting Juliani to feature on the remix to the said single – a touch of genius. At Kijiji Records he went on to record Pendo Kweli with Kanjii, one of the industry’s veterans and leading lights. Pendo Kweli begun to see the artist diversify his sound, with any fans of secular rappers Common or The Roots sure to find irresistible the neo-soul meets hip hop connection. Together with Astar, and fellow hip-hoppers Rigga and Michelle, they formed the nucleus of the monthly youth gig known as Hip-Hope. The group has gone on to release several compilation CDs featuring the three of them as well as the now extended Hip Hope family and other Kijiji artists. Juliani has continued to be a prominent part of Hip Hope, bringing to the group an outstanding street flair and exceptional flow. His apperances have also included one with Holy Dave on the monster crunk smash Not A Joke, as well as memorable spots on jams by the Hip Hope members. julianiAs far as solo material is concerned, Juliani teamed up with Gospo-Epic’s DJ riQ to release his very first artist mixtape, which was received fairly well on the streets. His singles have continued to capture the imagination of Gospel fans - the older Jesusnosis is still an unrivalled work of art, while his most recent jam, Mtaa Mentality has been a run-away hit, with a top-flight video to boot. 2009 saw Juliani become the first local act to get signed on a UK label. Gatwitch Records snapped him up, and soon after he released his critically acclaimed debut album, Mtaa Mentality, which features hit singles such as Biceps and Hela. The album also went on to garner two accolades at the 2009 Groove Awards - Best Hip-Hop Album (Mtaa Mentality), and Best Hip-Hop Single (Mtaa Mentality). Juliani is the 3rd born with 6 siblings (only one girl) and live in K-South with his mom Alice and dad Killion. Look out, Juliani’s on the loose.